It's good to be back at work, I think, after nearly a week of being away. Yes, I spent more time away for an exam than any vacation I've taken within the past three years (which included the end of undergrad and other times where such a break really should have been in order!). I wish I had remembered to take a picture of a cross-section (it was melting in the heat and looked unappetizing anyway), but imagine a chocolate outside with a green inside! The texture was chewy, and no, there was no taste of veggies in there at all. It mostly had a subtle sweetness. 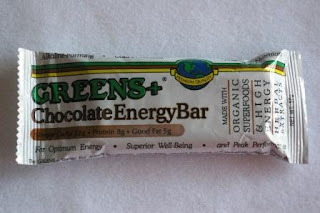 It reminded me a lot of other protein bars (the chewy part of it, anyway), and there was no spirulina, whey, or other weird aftertaste. On a related note, Diana from Greens+ sent me a package of Chia seeds, so I will be getting to that this week and reviewing it later. Yay for a short week! I am going to be off for half of the day on one of them because I team that I am on is leading a focus group for a non-profit. It's been a while since I've worked with a client, so to speak, so this should be good.